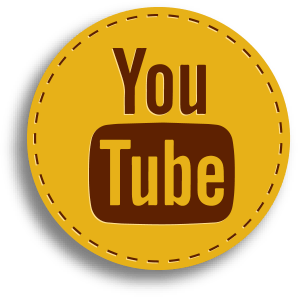 Single-Site Surgery… Performing Complex Surgery Through a 1-inch Incision! As proven leaders in robotic surgery, Tomball Regional Medical Center and Dr. Brian Harkins has accomplished yet another milestone!!! Single-Site surgery on the Da Vinci Xi robot premiered at TRMC on May 4, 2016. Dr. Harkins accomplished the first Single-Site cholecystectomy on the Xi in Houston… in Texas… and one of the first ten in the country. The FDA recently released approval for the technology to be applied to the Xi platform which allows gallbladder surgery to be done through a single one-inch incision at the umbilicus. Currently, the approved surgeries are Cholecystectomy, Oophorectomy, and Hysterectomy. As experience grows and technological advances continue, expect more and more surgery to be done through ever decreasing incisions! While one could expect to pay a premium for this state of the art technology the reality is that the cost is ever less than the robotic multiport equivalent. Dr. Harkins is currently seeking patients to assess if they are candidates for Single-Site on the DaVinci Xi. 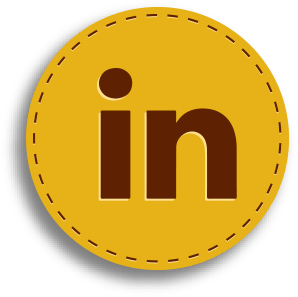 In fact, as of press time for this newsletter, it’s the only place you can get in Houston! Some of you may recognize the term Single Site or Single Port. The concerted effort to introduce this approach into laparoscopy began in 2007. Studies proved it safe and effective. The increased degree of difficulty in doing the operation, however, resulted in limited penetration into the field of surgery. Placing 3 instruments and a camera through once trocar and trying to find enough room to manipulate all of that in close quarters was challenging at best. Not to mention that the limited working room required the instrument on the left of the screen and visa-verse for the other hand. It was kind of like operating looking into a mirror while playing Twister! No wonder it didn’t catch on as expected. But if you connect all the instrument to the robotic platform then Presto… hard becomes easy. The robot is designed to manage the tight quarters and the computer adjusts the view for the unnatural angles and visual associations. The older model DaVinci Si was the first robotic platform to have this but many surgeons had limited access to a robot making that the rate limiting step for adoption. Robots are increasingly more available and general surgeons are quickly adopting the platform. Couple this with added safety in identifying the ductal anatomy using Firefly visualization (see side panel) and it’s easy to see how the future of minimally invasive surgery is the header in “1” direction. 1 incision, 1 inch long equals 1 happy patient! “One of the aspects I like the most about being on the cutting edge of technology in surgery is the ability to interact with colleagues across the country as the surgical community helps to shape this emerging standard” stated Dr. Brian Harkins in a recent lecture to surgeon colleagues in Minneapolis, Minnesota. He pointed out that the surgical community has seen this happen before. The early 1990’s saw the emergence of laparoscopy as a standard practice in general surgery. Most laparoscopy prior to that was performed by gynecology. In less than a decade, laparoscopy became a gold standard in many procedures and general surgeons became the most prolific laparoscopists. Dr. Harkins is recognized as a world leader in experience using the Da Vinci Xi system in General Surgery. 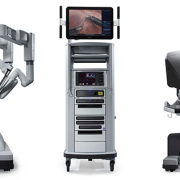 General Surgery…The Fastest Growing Specialty in Robotic Surgical Procedures! Tomball Regional Medical Center has become the first hospital in the Greater Houston Area to have two of the latest Da Vinci Xi robotic surgical systems in use. This doubles patient access to this highly sophisticated platform compared to other local hospitals. 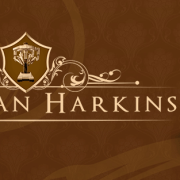 Dr. Harkins continues to be the most prolific user of this advanced technology. He is able to perform increasing numbers of more complex surgical cases. The winners…patients who are receiving state-of-the art care from a leading expert without the need to travel out of the area. The repair of an incisional or ventral hernia using an open technique requires a large incision with all of the pain and recovery delays that go with that but the approach allows for more options to close the defect. Using laparoscopy results in less pain and a quicker recovery but most laparoscopists don’t close the defect. A mesh is placed and bridged across the defect and then it is usually tacked into place. This leads to higher event ration rates and increased recurrences. Each approach has advantages, but also significant disadvantages. Incisional/ventral hernia repairs using the robotic platform represent the fastest growing procedures in robotics. With nearly 200% year over year growth since 2012, the procedure is on its way to becoming the new standard of care. More than 17,000 incisional/ventral hernias were done in 2015. Many of the most renowned leaders in hernia repair surgery have shown enthusiastic support. Dr. Harkins has vast experience with this approach using the Da Vinci Xi system! The “All-In” adoption of the robotic platform has “quickly” caused Dr. Harkins to be recognized as a leader in General Surgery in overall experience using the Da Vinci Xi system. Because of his success he was recently invited to be one of only 6 surgeons to attend the Intuitive Surgical World Wide Meeting. 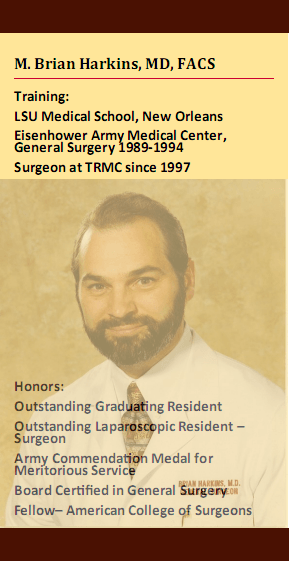 He spoke as a surgeon expert to help improve the knowledge of the attendees and to help them understand the literature, the medical and surgical facts, and the perceptions and interactions from the surgeon’s viewpoint. 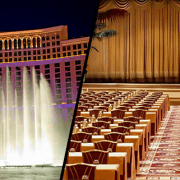 While he happily fielded questions from all areas he specifically focused on incisional and ventral hernias when interacting with the over 1200 attendees at the Bellagio Hotel in Las Vegas, Nevada. Las Vegas Nevada is the site for this year’s Worldwide Sales Meeting for Intuitive Surgical, the maker of the Da Vinci Xi Robotic Surgical System. Dr. Brian Harkins is one of a select group of surgeons who has been invited to be in attendance as a “Surgeon Expert” to help educate and provide the surgeon’s perspective to the attendees. His focus at this meeting will be his experience and knowledge regarding the robotic surgical system to accomplish hernia repairs. Across the country and worldwide the robotic surgical system, an advanced minimally invasive platform, is demonstrating rapid growth and acceptance in many areas to include ventral, incisional, and inguinal hernias. As a leader in experience using the Da Vinci Xi, Dr. Brian Harkins is proud to offer this state-of-the-art surgical care. In his over 20 years of practice in Northwest Houston he has cared for patients who have sought him out from across the United States and abroad. Your Patients Will Be Asking! Its too expensive! Its adding technology without adding benefit! 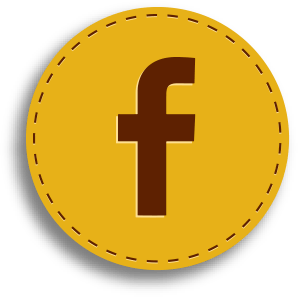 It will never last!…Robotic Surgery? No! Those were pushback comments in the early 1990’s about the introduction of laparoscopy into the world of surgery. Improved patient outcomes rolled right over those objections to create a new standard in many surgical procedures. But if we recognize that minimally invasive surgery is better for patients, then after 30 years of laparoscopy, why isn’t every procedure being done that way? The short answer…some procedures were just too “hard”. Laparoscopy had limitations that kept it from completely replacing open surgery altogether. tient outcomes in terms of lengths of stay, complications, post-operative pain, blood loss, and readmissions. Wow! 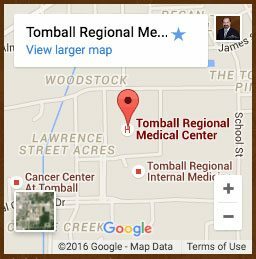 The long awaited upgrade for laparoscopy is finally here!…and its available right here in Tomball!! Little did I know when I did my first robotic case on 29 September 2014 that by the end of my first year I would be the second most experienced general surgeon in performing cases with the Da Vinci Xi system in the world, but that’s what has happened! I already have many personal examples of patients who would have likely undergone an open procedure if it weren’t for the robotic platform. The vast majority of these patients have enjoyed the benefits as complication rates have remained low when compared to the previous year. I wish I could say that low meant zero, but that’s just not the reality with surgery and medicine. However, I do have great hope that in the robotic platform I now have the tools and ability to move even closer to that zero complication rate threshold. In my efforts as the Robotics Chairman of the Department of Surgery I have continued to focus the program on patient safety and staff education. TRMC Administration and Surgical Services have responded in establishing us as the only robotic program in Houston with 24/7 full access to accomplish surgeries on the robot. The evolving standard is always available here! I am very excited to be on the forefront of this new horizon in general surgery and will continue to offer your patients the most advanced surgical care available. Best of all, they can get that care right here in Tomball. Intuitive Surgical Incorporated’s first robot was developed in 1997 but the system did not get FDA approval until the year 2000. Improvements over the original resulted in the Da Vinci S release in 2006. In 2009 the DaVinci Si platform furthered propelled the success of the robotic surgery movement with ongoing transition of prostate surgery and malignant gynecological surgery to being almost completely done with the robotic platform. The advanced technology additions to the DaVinci Si platform began to show promise in the adoption by general and colon and rectal surgical specialties. The “game changer” as many surgeons refer to it, was the release of the Da Vinci Xi platform in 2014. Our first robot at TRMC was the early model DaVinci S which we obtained in 2012. We traded that in for our new DaVinci Xi, the second one to arrive here in the Houston area, in July 2014. 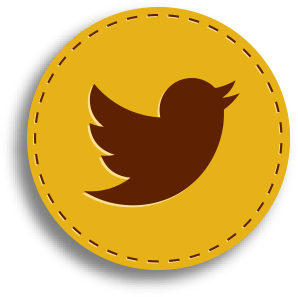 The rest, as they say, is history…in the making!!! A new robotic-assisted surgical system is paving the way for improved patient outcome statistics at the Tomball Regional Medical Center. TRMC purchased and implemented the new robotic surgical platform in 2014. Dr. Brian Harkins, a surgeon at Tomball Regional Medical Center, said he has carried out the second highest number of general surgery cases using the new robotic platform of all surgeons in the world. 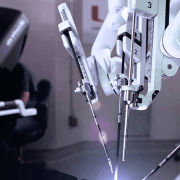 During a robotic surgical procedure, a surgeon is seated at a console with an armrest and headrest and can control the precise movements of the robot with his hands, Dr. Harkins said. The robotic technology allows for improvements in dexterity with “wristed” instruments, ergonomics of hand motions, 3-D vision and an increased possibility of single-incision surgeries, Dr. Harkins said. A significant portion of procedures traditionally carried out by open surgeries that may require multiple large incisions are now being conducted with the robotic platform, such as hysterectomies and prostatectomies, Dr. Harkins said. However, one of the drawbacks of the robotic surgical platform is its financial cost, Dr. Harkins said. When first implemented several decades ago, laparoscopic surgery was a more costly option for hospitals, and now it is recognized as a standard for many procedures, he said. 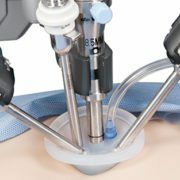 The robotic surgical platform is the most advanced technique available for abdominal surgery, Dr. Harkins said. TRMC plans to continue improving recovery times for patients and reduce surgical complications with the robotic platform, Dr. Harkins noted. With more funding, TRMC seeks to upgrade and implement a newer model of the robotic platform with additional surgical capabilities in the near future, he said. Susan Caesar is about to perform a minimally invasive procedure using a robot. It’s her first time and she’s not even a doctor. She actually works at Hewlett Packard. Ok, the robot is real but the patient is not. 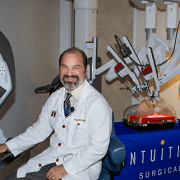 This is just a demonstration of the Davinci Xi robot by Intuitive Surgical. Doctors affiliated with Tomball Regional Medical center are showing it off and letting employees at HP put it through it’s paces. The robot can take the operators large motions and make them smaller with incredible precision. Its the newest thing in minimally invasive surgery. The doctors love it and say the patients do too..
“Right now with this I get better visualization and the patient experiences less pain and quicker recovery with it.” claimed one surgeon. Not to mention fewer complications afterward like post operative infections that could lead to costly readmissions. But at two million dollars, many hospitals might balk at buying one. “But just like laparoscopy is still more expensive for a gallbladder than an open surgery yet we do it anyway because the patient outcome is better.” said Dr. Brian Harkins. He says surgical robots like this are the future of medicine, and the future is here. The robot consists of 3 separate but interconnected parts. The “Patient Cart” (above) holds the instruments and connects to the trocars. The “Vision Cart” is similar to the laparoscopic tower. The “Surgeon’s Console” is where the surgeon sits and controls the “robot”. Improved Vision! Surgery with an HD, 3D, magnified, totally immersed view. Wristed Instruments! This is a huge return of dexterity that was lost in laparoscopy. Improved Ergonomics! Now surgeons can sit in the same supported, comfortable position for every case. FireFly Visualization! A special dye is injected into the patient. A built in laser light is turned on. Presto! In the laser light the dye glows and now the surgeon can see incredible detail about bowel vascularity or the bile ducts right through other tissues. Vessel Sealer and Stapler! Rock stable control of these technologies allows greater precision and control in the critical use of these devices.